Thanks to an Instagram post by Pink Dot, I find out that today is Transgender Day of Remembrance. Transgender Day of Remembrance is an opportunity for communities to come together and remember transgender people, gender-variant individuals, and those perceived to be transgender who have been murdered because of hate. On that Wikipedia page it is also stated that the Canadian province of Ontario passed the Trans Day of Remembrance Act on 12th December 2017. This officially recognizes TDoR and even requires its Legislative Assembly to hold a moment of silence every year on 20th November. My respect for Canada just grows and grows. They are truly a progressive and compassionate nation. And it goes on and on and on. And that’s just the Memorializing 2018 list. I can’t help but wonder how many of these sick acts were done in the name of religion, by horribly misguided sick f**ks. Many, I suspect. Rest in Peace, brave, beautiful soul. I can’t help but think of Aleesha Farhana as well, who passed away on 30th July 2011, also in Malaysia. She was not murdered, but I take this occasion to remember her too. She died of a heart attack, at only 25. To read my post back in 2011 which included something about her, click here. 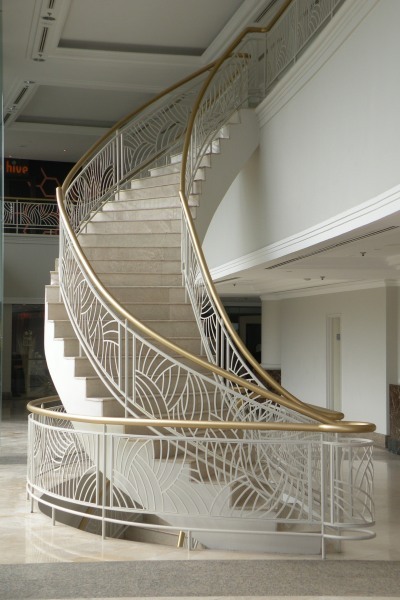 Every so often I would think of how this site needs pictures of some gorgeous hunks to liven it up a bit, or sometimes I want to share some images of some interior design that I like. But to write a post around a photograph that’s not even mine (by the way, the three photos below were taken by me), well I guess it’s okay once in a while, but I think it’s better to just use another platform such as Pinterest and just put the address of the site at the sidebar here if anyone is interested. Pinterest is a photo sharing website. It had proved to be useful for my work but I mainly use it as a way to relax. It’s like being sprawled on the sofa lazily leafing through a glossy magazine, but even lazier that that. Because if you come across something nice and you want to file it for whatever reason for later, it just takes a few clicks as opposed to ripping out a page or scanning it. I enjoy using it as I get to file ideas, or just images that just strike me as interesting, in neat little folders. They call these folders ‘pinboards’ over there, and the images are the ‘pins’. The first time I used it was a few years ago when a friend asked me to design a shop he’s setting up. I was busy with work commitments, but still wanted to help in some way. I got the idea to start a Pinterest website to compile lots of ideas I thought would be relevant to him, and e-mailed him the address of the site so he could have a look anytime. And then some time later when we were proposing the supply and installation of terracotta floor tiles for a client, she didn’t quite fancy what she saw in the few catalogues I had in the office. So again I turned to Pinterest to gather images to better relay to her what I think would work for her. The ideas were neatly divided into different pinboards like finish, layout, and pattern. Pinterest is useful and convenient like that. You can also pin images you come across on other platforms, including Tumblr, which I’ve also used on and off for some time as a way to compile images. I used to have 2 or 3 Tumblr sites at any one time. One would be for work, for example design ideas and solutions. Another would be fitness-related for example fitness tips and motivational quotes. Another would serve as inspirational eye candy (let’s just call it that). Also for things like, you know, recipes, things like that. Then it got tedious, having so many sites. I barely use my Facebook as it is. When I started this latest Pinterest, I thought I would painstakingly bring over all the images that I had collected on my Tumblr sites and previous Pinterest sites, but I decided that would be boring and tedious (read: I’m too lazy to do it). I’d rather just spend the hours idly looking at new images and ideas. This Ramadan, I was taught kindness and forgiveness by a Catholic. Ramadan is coming to a close. I was thinking of this holy month. Of what it means to me. If I had learnt anything more of myself from it this year. I even typed ‘spirit of Ramadan‘ online, hoping to read posts of what that means to other Muslims. The more I thought about it, the more I decided that without a doubt, the most impact an individual has personally had on me this Ramadan is Mr. Sim Siak Heong, who is a Malaysian Chinese and a Catholic. Through his actual actions. Not just words, or prayer, or advice but through actual deed. 67-year-old Mr. Sim was the victim of a terrible road bully incident earlier this month, where he had accidentally hit the new Peugeot car of 30-year-old Siti Fairrah in a car park in Kuantan, Malaysia. She not only got out the car and heaped abuse on him like some crazy thug, and demanded cash on the spot, but hit his car repeatedly with a steering lock. Thankfully it was recorded on video. It was very painful for me to watch the video as I can’t help but feel really bad as a Malay and a Muslim. I also felt angry that a senior citizen was abused so badly. I actually had to pause the video several times and considered closing the page, but I forced myself to watch it till the end. I am glad for the existence of the video recording. I look at it as a valuable lesson and reminder of what can happen if I experience rage at someone but fail to control it and rein it in. I hope the person who took the video pats him or herself on the back for doing such an important public service. It’s because of the video, which understandably outraged a lot of people, that the police pursued the case. Siti Fairrah was fined RM5,000 and ordered to do 240 hours of community work after she pleaded guilty to intentionally causing damage to Mr. Sim’s car. Kudos to the Malaysian police as well for still going ahead and taking action against her despite the saintly Mr. Sim declining to lodge a report, even when the police advised him to do so. And to the general Malaysian public online regardless of race and religion who condemned the road rage incident. And yes, to Siti Fairrah as well, for admitting what she did was wrong and for apologising to Mr. Sim publicly. I’d like to put here an excerpt from a beautiful post I came across on a site called Islamway.net, as I was surfing around online finding and reading what ‘spirit of Ramadan‘ means to other people. Ramadan is a celebration of God’s guidance to humanity, through the Quran, which is a guide for doing good and a warning against evil. In order to bring the soul into harmony with the Quranic ideals of belief and virtue, fasting is prescribed as a way for individuals to come closer to God and to lift their souls to new heights of piety. In doing so, the entire human body is able to transform itself into an agent of positive moral and social change that seeks to replace miserliness with generosity, anger with patience, revenge with love, and war with peace—in effect, replacing good with evil in the world. Of course, kindness and forgiveness are for all times, not just Ramadan, but I feel that’s when we Muslims, as we fast, are more reminded to think and do more for the lesser off and to reflect on our character. When I say ‘spirit of Ramadan‘, I am also referring to virtues like patience and calm that Mr. Sim had displayed when confronted with such an ugly face of road rage, and the provocation it challenged him with. I think it’s such a beautiful thing when we are taught these virtues from people of other religious faiths or even people with no religious faith as well. It reminds us that there must be mutual respect. Because at the end of the day, life comes down to treating everyone else the same way we ourselves wish to be treated. That sounds so easy and logical, it sounds so easy to remember, yet strangely and unfortunately it’s apparently so easy for some of us to forget. I can’t seem to find a decent photo of Mr. Sim. 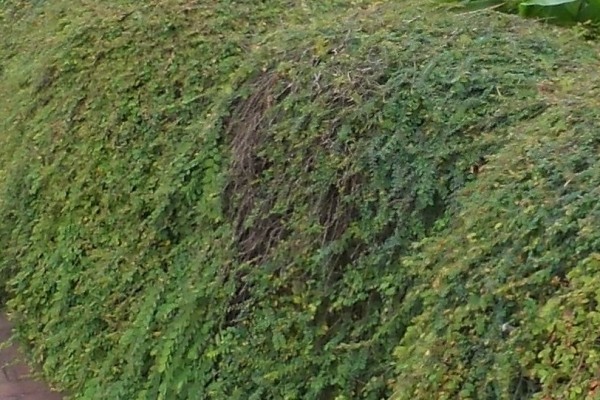 This one is taken from a still of a video. From forum.lowyat.net, via Google Image. Click to go there. The following video is the Astro Awani interview of Mr. Sim from where the image above was from. It’s in Malay. I just sighed in sadness when I watched it. Damn, what a terrible thing to have happened to such a kind soul. 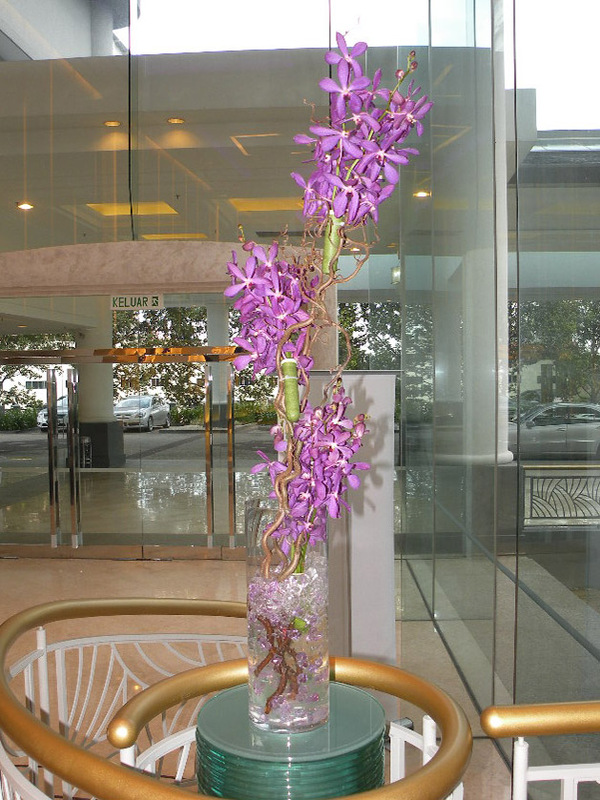 The entrance of the restaurant at the lobby of Grand BlueWave Hotel. This is an Indian restaurant my sister brought us to in Johor Bahru. She’s been wanting to introduce it to us for some time as the food is really good and the prices are very attractive. We totally agreed with her. The restaurant is located at the Grand BlueWave Hotel which is mere minutes from Causeway CIQ (Customs, Immigration & Quarantine) centre. So it’s very convenient for Singaporeans who just want to hop over to J.B. for a few hours like, say, shopping mainly at City Square. They serve a buffet lunch for Ringgit Malaysia (RM)25. That’s like Singapore (S)$10! And it’s nett price! Buffet! Less than ten dollars! Nett! And it’s not even one of those buffets that are economically priced but then get you to fork out for expensive drinks. No. This one came with a free flow of drink too. Bert and I were excited at the thought of pigging out at a buffet for less than ten dollars. So far, the best deal we had experienced for buffets was at the then-newish Shangri-La Hotel in Chiangmai, which was the equivalent of about S$16. Yes, a Shangri-La hotel buffet for only S$16. Amazing Thailand, indeed. That was in 2009, though. 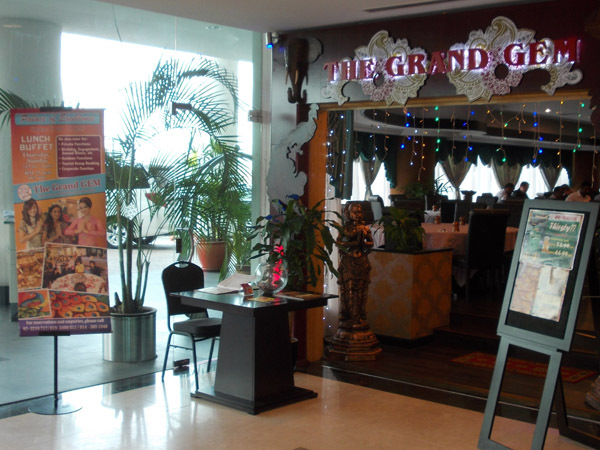 At The Grand Gem, the buffet is even better-priced. Unfortunately, it was not meant to be for us that day. Their buffet lunch is only from Thursday to Sunday, and we could only make it to J.B. on a Wednesday. However, Bert caught sight of a leaflet at the entrance that informed us there were set lunches for RM18 (less than S$7!). There were a total of 4 choices offered. 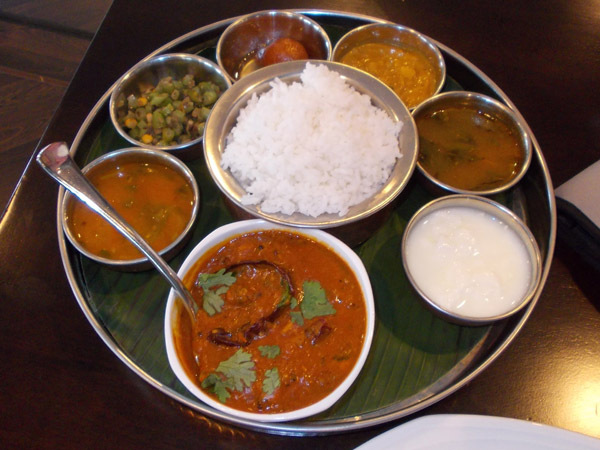 My choice was this – called the ‘Non Vegetarian – Fish‘ set. The rice looks little but the metal bowl it comes in is deep and the portion was actually enough for 2 persons. While Bert went for the Naan bread set, served with chicken curry. 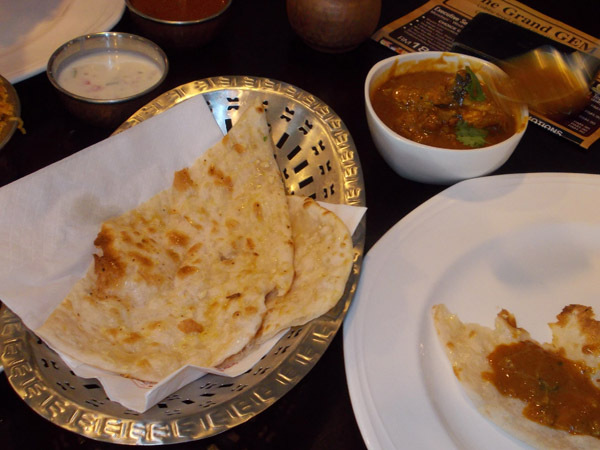 He ordered two more garlic Naan, and that was RM6.50 (about S$2.50) each, and then found it was too much food for him. I was happy to help him finish. My mouth is watering as I type this, looking at the pictures and recalling the deliciousness. Everything was delicious. Only a few tables (about ten) were occupied when we were there at lunchtime during the non-lunch-buffet weekday we visited. Just how I like it: pleasant, relaxed and not noisy. 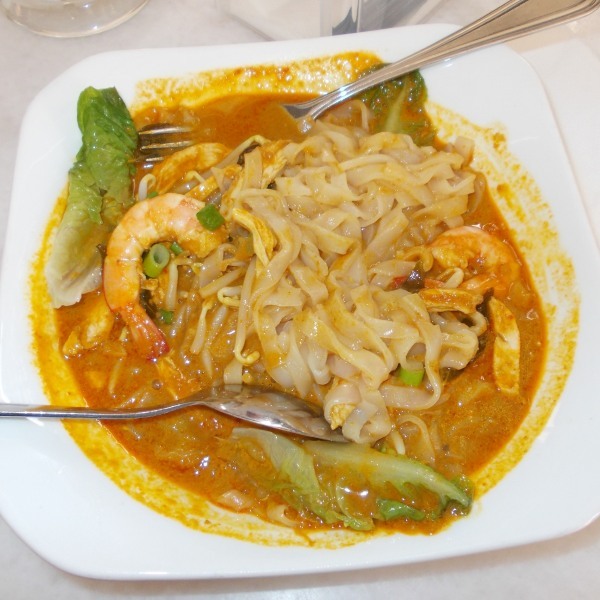 Service was attentive and gracious, with polite friendly staff with easy smiles. The food took some time to be served, although we didn’t wait too long. Just how I like it. If it had came out too quickly I’d suspect it was just dumped in the microwave to be reheated. Our RM18 sets each came with a sweet drink like mango juice or lassi, a delicious and refreshing yoghurt based drink. Generously portioned in a tall glass. Besides this, water was also served, cold or warm as we wished. My sister was driving us and her carpark charge at the BlueWave Hotel was RM4. Her car was parked there for maybe around an hour and a half, I think. The decor was very nice. 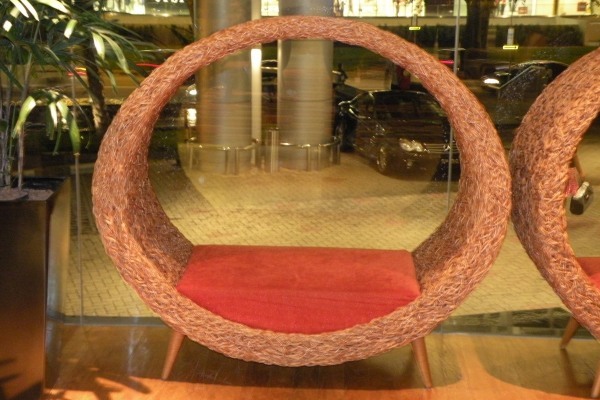 There were the touches you’d see in an Indian restaurant, set in an opulent yet largely modern and refreshing design. I didn’t take many photos and besides my photography is ultra basic, haha. For a better idea of how nice the restaurant is, please head over to the following blog for some really beautiful pictures in its review, including the buffet: JB Foodie. 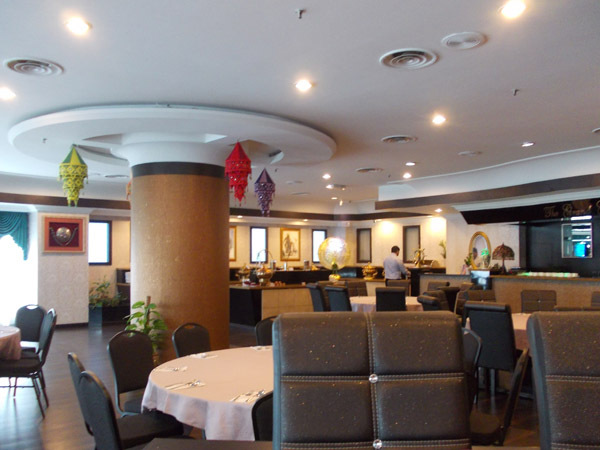 Facebook of The Grand Gem restaurant – with information about their buffet and other promotions, as well as general info like address and opening hours. 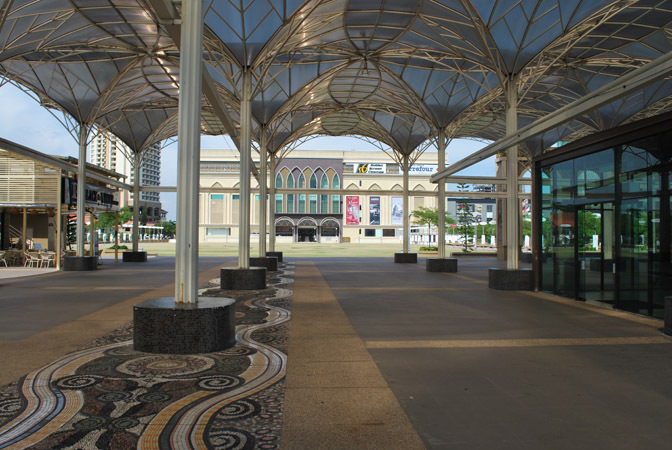 Google Map – Grand BlueWave Hotel, Johor Bahru. Day 99 of ‘100 Happy Days‘. So, my lunch at The Grand Gem with Bert and my sister is the very last thing that made me happy that I’m noting for this 100 Happy Days saga. Tomorrow I’ll wrap it up on the 100th day by noting how freaking happy I am that I’ve done this thing, and what it is that I’ve learnt and discovered from the interesting experience. 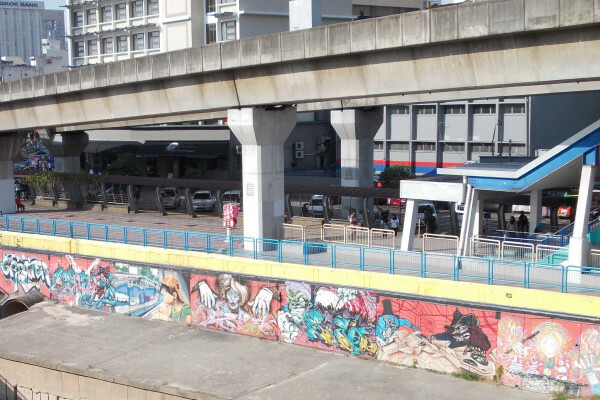 When we were in K.L., there was a metro station just about ten minutes walk from our hotel, so it was convenient to use their excellent commuter rail system to get around the city for sightseeing. 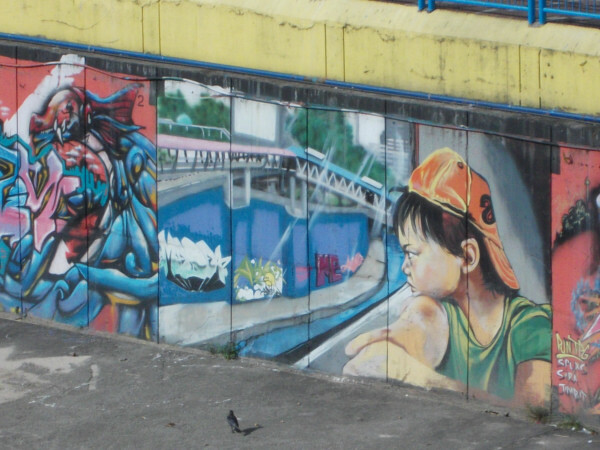 This is the street art we were treated to on the way there, along a canal drain we would cross to get to the station. My favourite panel. A kid gazing out a train window at what I’m guessing is the exact spot or area we’re at! The same canal, the same bridges we crossed, the same wall of graffiti. Neat. On the drive back from a long weekend trip to the resort town of Port Dickson, my brother and sister-in-law very kindly decided to stop by the historical city of Malacca for Bert’s benefit as he had never been there before, and to grab lunch. We only had a few hours, so we only caught glimpses of three sights very quickly: the A Famosa Fort, the Malacca Sultanate Palace, and the Independence Monument Museum. I’ll post pictures someday, probably when we have returned there to visit it ‘properly’, as Malacca is a very interesting city-state. One of the smallest states in Malaysia, but one of the most fascinating as it is rich in history and culture. 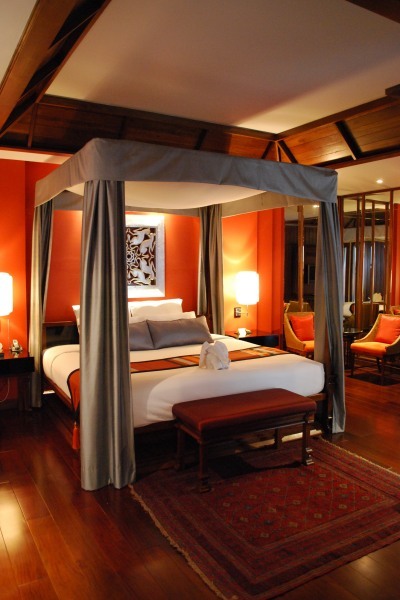 It is in fact dubbed ‘The Historic State‘ and is a UNESCO World Heritage Site with Penang’s George Town. Damn, wrong intro. After mentioning history and culture, all I’m going to show now are pictures from a shopping mall. Haha, sorry. Oh well, it’s just that, across where we ate was this mall with a lot of arts and crafts stalls. 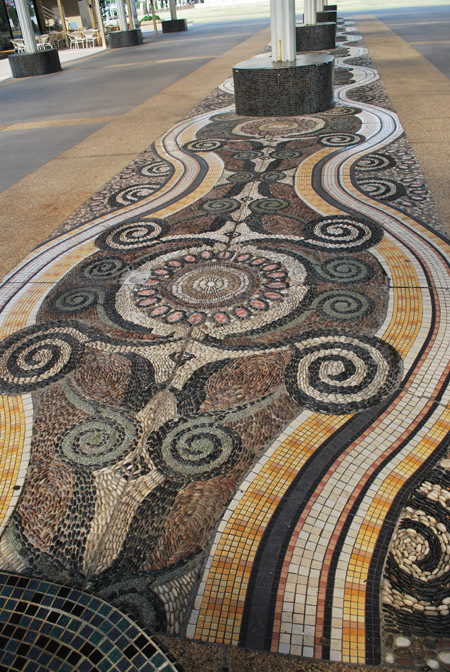 After visiting those, we went outside of one of the upper floors for a breather and there was this gorgeous mosaic work featuring what look like pebble stones. 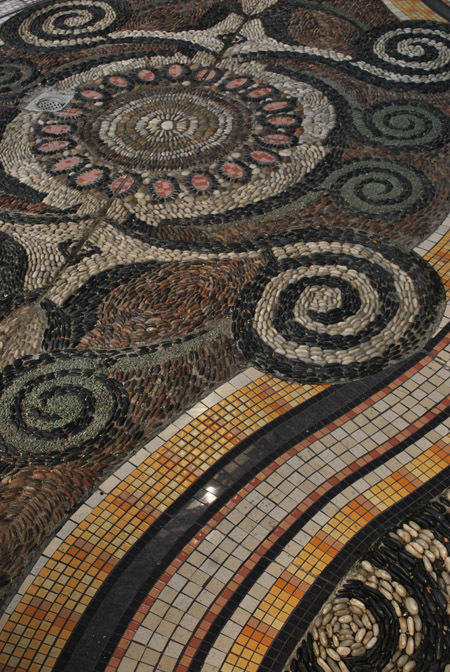 And that’s what I want to feature in this post, this really beautiful (to me) and large mosaic work. I haven’t had this for quite a while until lunch today, when I prepared some sandwiches for us. One bite and I wondered why I don’t have it more often. It’s tasty. 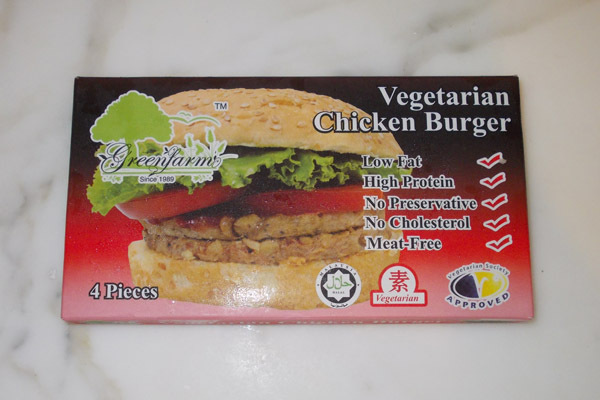 I got it from the vegetarian corner of the frozen food section of Jusco supermarket in Johor Bahru. I don’t know if it’s available in Singapore as I’ve never seen it in any supermarket here so far, including Mustafa Centre, which has quite the vegetarian section. After I prepared the sandwiches today, I actually wolfed down the whole thing before realising I had not taken photos yet, haha… Fortunately I have this last photo here in my image library. 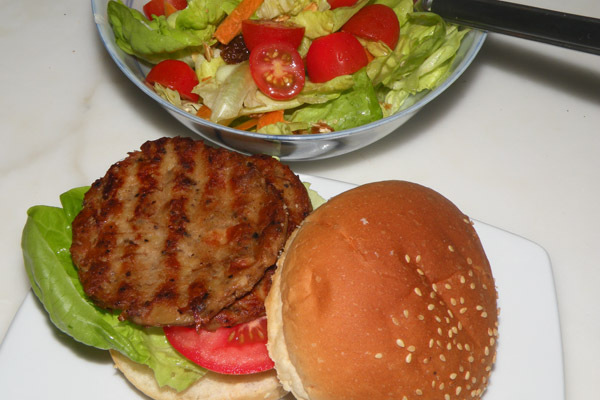 It is of the same burger patties, but from a previous meal some time ago. 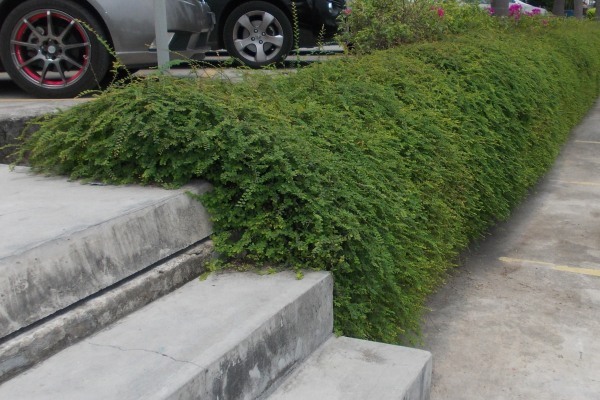 I came across this bush plant for the second time, this time in Johor Bahru, and I find myself marvelling again at how beautiful it is. I don’t know what it’s called, and how it gets its shape, but I love it. 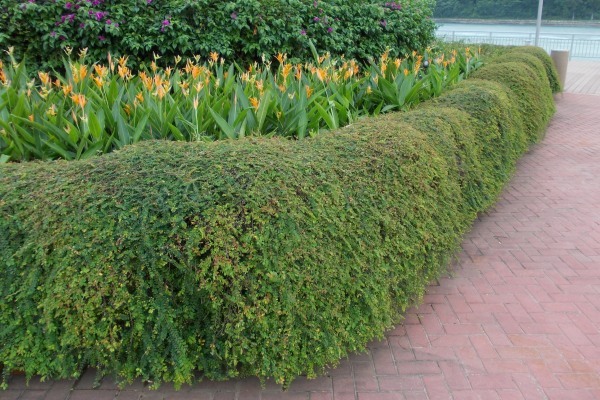 It makes me think of a well-coiffed hairdo. I like how it falls and drapes the sides of the steps. If the steps are tiled nicely instead of just this concrete screed, in something like terracotta for example, it would look gorgeous. 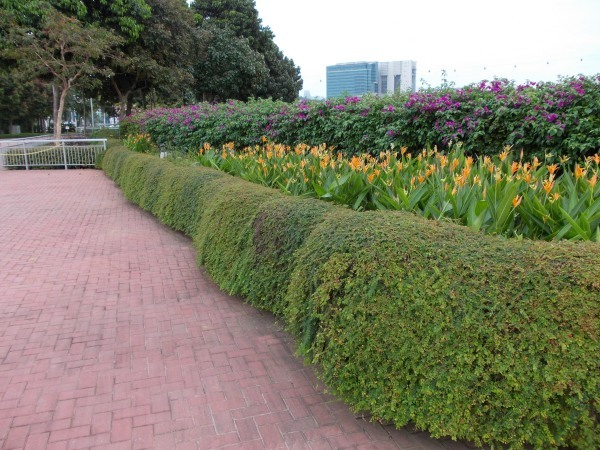 I first noticed it in January, taking a stroll along Keppel Bay. So very pretty, almost surreal. This is a great idea I saw at Thistle Hotel in Johor Bahru. I’d love to try it but first I need to get some test tubes, which I know is available at Art Friend, the art supplies store. I’ve seen arrangements using test tubes as vases but this one is really interesting and beautiful to me. 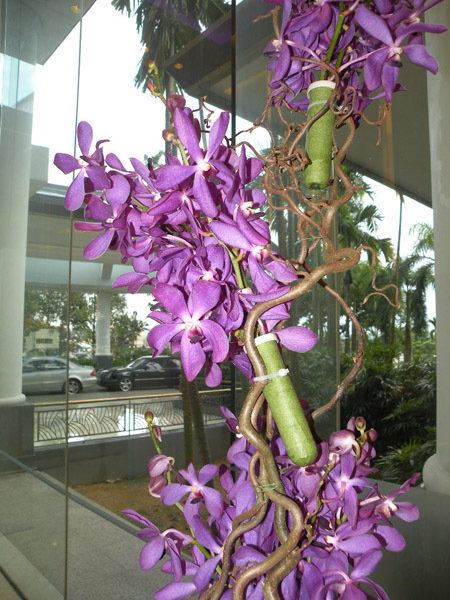 The tubes are tied to decorative dried branches or sticks, and each one holds a small bunch of flowers. I don’t know what these green tubes are and where to find them, but no matter as I think regular test tubes made of glass would look better, anyway. I also wouldn’t use those industrial-looking nylon cable ties which to me spoils the look of the arrangement. I would simply use the regular green floral wire, or alternatively, a thin fabric ribbon tied into a simple bow. We experienced the coffeeshop/restaurant Tea Garden Junction in Johor Bahru for the first time . It was very good. Really good, when you consider the prices. I think that’s the name of the above dish I ordered for myself. I don’t quite remember, it was a blur once I had my first slurp of the curry. I inhaled the thing in a matter of minutes. The curry was so good; so thick and rich. Bert had the ‘Nasi Lemak Rendang Mutton’. RM9.50 (about S$3.80). 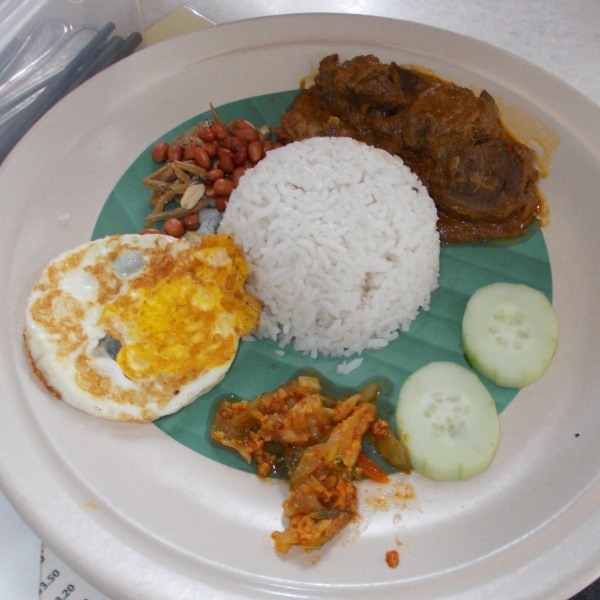 He said the Nasi Lemak was delicious and rich with the taste of coconut milk. I thought the portion of the rice was a bit itsy bitsy, but then again too much rice is really bad for you, especially of the rich variety like this. The mutton rendang was good too. With prices like that above, it’s more economical than eating at a food court in Singapore! And you don’t have to stand around hovering at the stall till your food is ready, although ordering itself is via self-service. The place-mat menu is on the table. So is a stack of order chit and pen. You write the code number of what you want and bring that to the cashier where you pay for your order. Then a runner brings your order to your table when it’s ready. The prices of drinks are reasonable, but look strange next to the food. 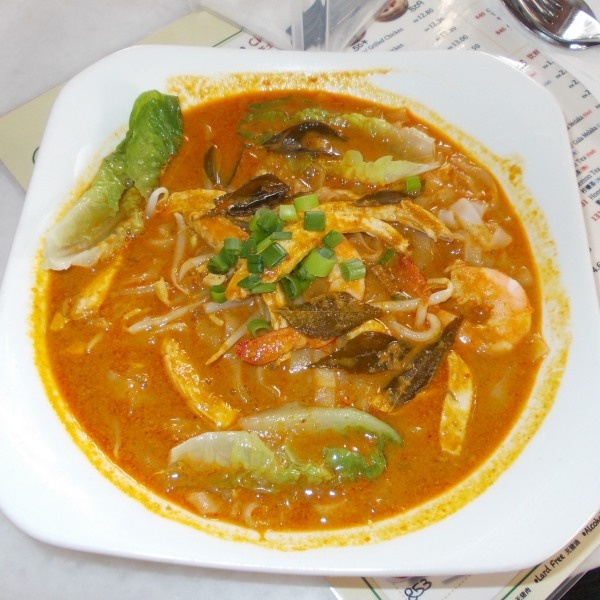 For example you could have a Mee Siam for RM4.50, but the drink you order could be 2.50 or 3.50. Soft drinks are RM2.50 (about S$1.00), if I remember correctly. You could have plain water at 50 cents, but I was guessing it came straight from the tap, and honestly I’m not comfortable with that there even if filtered, so I didn’t have that. I didn’t check the price of bottled water, probably the same as soft drinks. Definitely dropping by a lot whenever we have the chance. 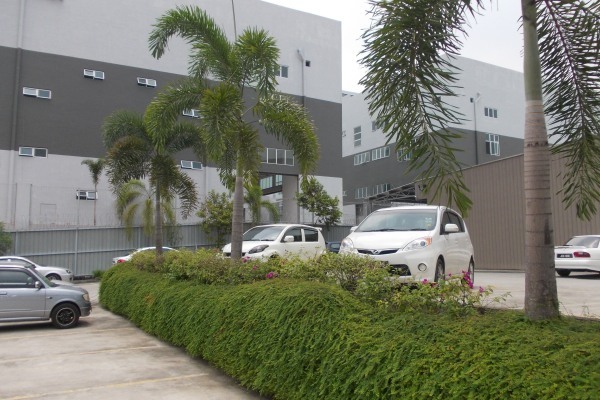 Located at Jalan Mutiara Emas in the Taman Mount Austin area. I don’t remember the exact number of the road, but it’s next to Jubin BMS, the mega tile store. Click here for the map there. If you are the copyright owner of something I've used here, like a photo, illustration, any other image, etc, and you don't want it here, please let me know in the comments of the post where I've used it. I'll remove it upon my next login. Thank you.